Welcome to a new challenge with the Paper Craft Crew Design Team! 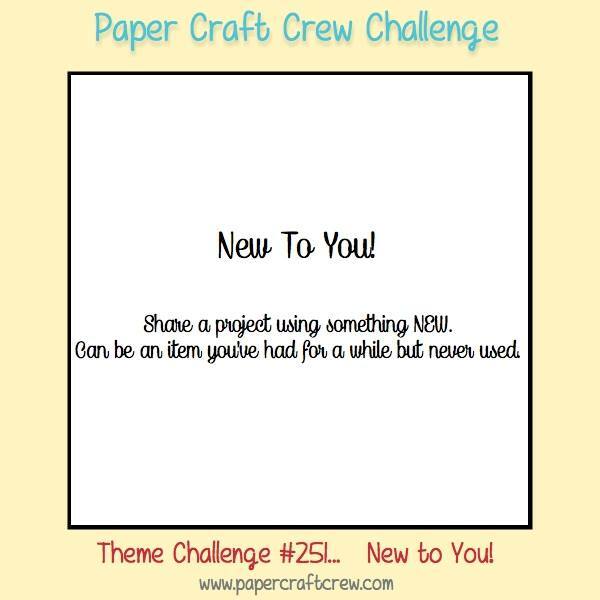 This week is a New To You challenge, where you use a product, tool, paper, whatever that you haven’t used before, and use it in your project. For some, you may find a stamp set or patterned paper that’s been hiding in your stash! Or maybe you’ve just got your new Stampin’ Up! order, and have lots of new products to choose from! This was perfect timing for me; I had just received my new Host set, Tranquil Tulips! I also had my Wood Crate Framelits that I had only used once, for my New Catalogue party, so I decided to combine the two. 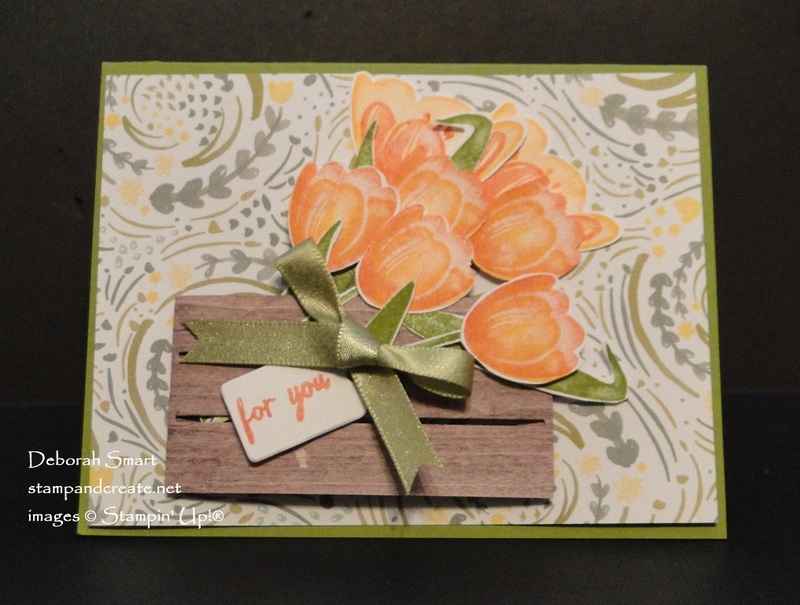 To create the tulips, I stamped the background colour in Calypso Coral, then stamped the detail on top in Peekaboo Peach. I really like this colour combination! The leaves and stems are all stamped in Old Olive ink. There’s no matching dies for this set, so I hand cut all of the flowers, stems and leaves. For the crate, I only needed to die cut one, since I was attaching it to the card front. The Big Shot and Wood Crate Framelits with the Standard Cutting Plates were used. No fancy technique was used for the wood look; that was achieved using the Wood Textures Designer Series Paper Stack! I cut off the bottom of the crate, folded the sides on the score lines, and attached it to the card front with Stampin’ Dimensionals. This gave me room to slide the stems and leaves inside the crate. I alternately used Liquid Glue and Dimensionals to layer the flowers, leaves and stems. Calypso Coral ink is used for the sentiment, and die cut using the retired Tags & Labels Framelits. I used some of the beautiful new 3/8″ Shimmer Ribbon in Pear Pizzazz for the bow. Everything was attached to a panel of Delightful Daisy Designer Series Paper. 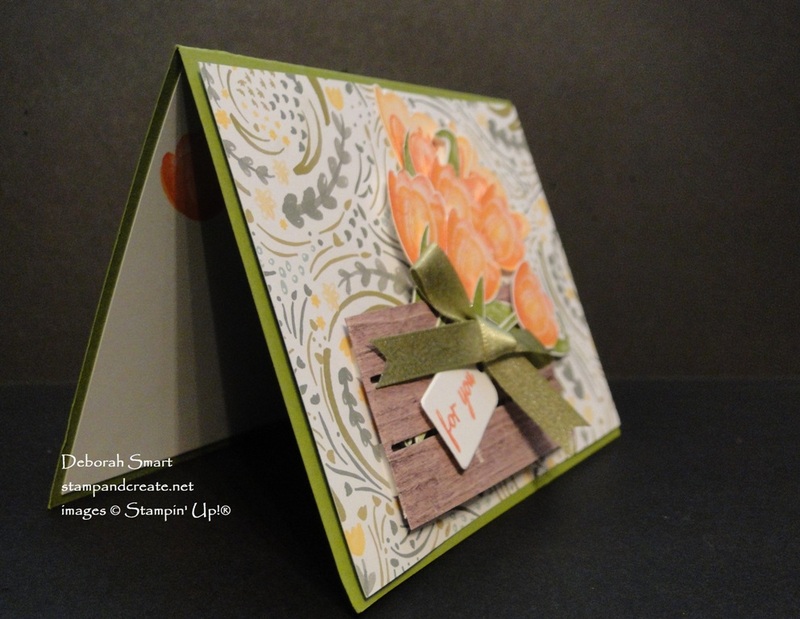 The card base is Pear Pizzazz cardstock. Now’s it’s your turn – find something you haven’t used yet, and link up your card for the New To You Challenge! Be sure to check out what the rest of the Design Team have created. Head over to the Paper Craft Crew blog page; that’s also where you’ll find the directions for linking your card. I’m looking forward to seeing YOUR project! The Tranquil Tulips set is a Host set, which means you can order it with a qualifying order of $200 or more. That can either be a total party order, or a personal order. For this set plus the other products used in my project, click on the images below. This is beautiful, Deborah. The crate and daisy DSP all work so well with the flowers. Thanks, Buffy! This little crate die is super easy to use. Lovely, LOVELY card. What a great combo with the crate and tulips.